The Fastest Pace My Garmin Has Ever Seen! So, I had a whole different post written up and ready to publish today BUT instead I have to tell you about last night’s run! I don’t have any pictures to share because I was totally focused…. Pretty sure my Garmin has never seen that pace before! My speedwork last night consisted of four miles: one mile warmup, one mile cool down, and two miles alternating 1 min hard, 1 min easy. I was mostly running my hard intervals at around 9:15 – 10:30 pace but a few times I saw my pace dip into the 8:30 range and then coming down the bridge I totally saw it drop into the 7s! HAD to text my coach right after! The lowest pace I saw was 7:55 but apparently I even hit 7:37 at one point! 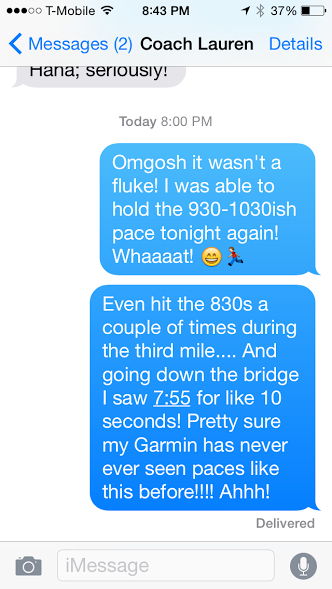 I’m sure it was when I was running the downhill of the bridge and had the wind at my back…. but I’ll take it! I mean, I really had no idea my body was capable of these paces at all! The best part was that I felt really in control the whole time! This is a pretty big deal because I used to feel like a baby bird flailing about while learning to fly for the first time whenever I ran fast! Maybe, just possibly, there is a faster runner deep down inside of me after all! I don’t mind being a slow runner, somebody has to be at the back-of-the-pack, but maybe it doesn’t always have to be me! So, last week I wrote about potentially dropping out of the Palm Beaches Half this coming weekend and the other day I made that decision final. My first DNS. 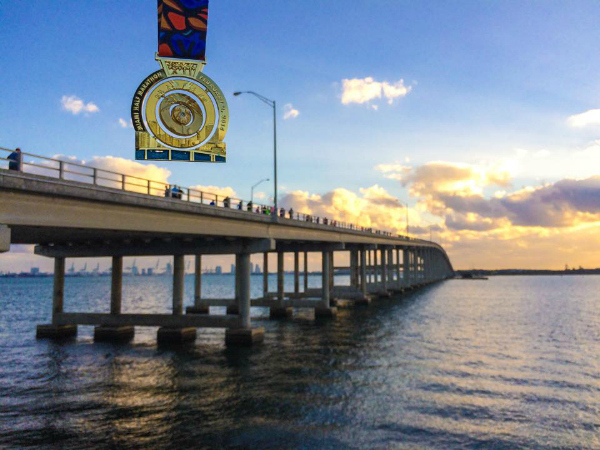 I’m now 110% focused on running my very best half in Miami at the end of January! I’m honestly feeling really happy about dropping out of Palm Beaches. I just couldn’t get myself excited about the race even after a good 11-miler last weekend and some great workouts recently. Instead I’ll run an easy 14-miler this weekend, my longest run since the marathon back in October! 🙂 I can’t wait! What is your #1 running (or workout) goal RIGHT NOW? Anyone going for a 5K PR before the end of the year? Previous Post Whooo! Negative Splits During the Long Run! That is so awesome! You are actually probably at a disadvantage living in Florida with no hills. The downhills are the best! Sounds like you are making a smart decision and will do awesome in your next half! No 5k PR here before 2015 but a 10k! Absolutely!! The race I am running this weekend is going to be awesome! Half paved/half trail and I am going to PR!!! At least I hope so!! It is so awesome that you are seeing such fast paces!! I never knew I had it in me either until one race I ran the first mile in 7:35! Then 2 more after that (not that fast though). It is such an amazing feeling….you should be so extremely proud of yourself! It is not a fluke you are getting speedier by the day Kristina!!!! Half paved / half trail sounds awesome! Go get that PR, Staci!!! I have had several DNSs. All the cool kids do it! Hi, hello, that’s AWESOME! Congrats! My goal right now is to stay injury free through this marathon training cycle!! You’re gonna do it and I can’t wait to follow along with the whole journey!!! Look at this speed demon here!!! Feels amazing to knock out some fast intervals doesn’t it, makes speed work with the hard work. I know your going to kill it in Miami, now it has your attention and your going to dominate that race. Hopefully no waiting at the bridges :). Goal right now is our first full marathon in February. We have some races until then but the marathon is the main goal. LOL that’s right! Speed demon! That’s me! HAH! I got so excited seeing the title of this post I just had to read it right away! Eeeeek! That’s awesome! Way to go! You are making huge improvements in your running and it makes me so happy for you! NEVER doubt yourself. There IS a faster runner in there, and you are such a hard worker I know you can do whatever you set your mind to! You’re so right. I know I made the right decision (and you must have to) if we’re feeling good about dropping out of a race when we would normally be excited to race! PR’ing on NYE is the best way to toast to the successes of 2014. I’ve been thinking about signing up for a Resolution Run. I remember getting a couple of emails about them last year, but I haven’t head about any local ones yet! Awesome job–speed work really helps! I think it is a good call for the race this weekend. I can tell you are totally focused on January! That is one of the best feelings in the world. You killed it! Speed work definitely pays off. I see many 7s, 8s, and 9s in your future. 🙂 I think you made a good decision about the half marathon and putting all of your energy/effort into your half in January. I have a feeling you are going to surprise yourself. My number one goal right now is to run my last marathon/race of the year on Sunday and finish with a bang! The countdown to CIM is on! I am really so incredibly impressed that you’re going to run another marathon in just a few days! I just hope there are more 9s and 10s for longer periods of time! Being able to hold for one and two minutes is the first step towards being able to hold for five minutes and longer so I’m on my way! Thanks, Jennifer! That’s such a compliment because you are always inspiring me!! WooHoo!! Look at you getting faster and faster!!! I am convinced that any goal you set you will achieve because you are such a hard worker!!! Running fast makes me feel alive! You are truly amazing! I am so happy for you!! My goal is always the same: run 3-4 times per week keeping my mileage where I like it to be and not get injured. That’s it. Sounds simple but there are many times I struggle with it. I really like your simple goal and there are so many days when I ask myself *why* I want to race, run a 50-miler, etc. when I could probably be just as happy running 30-40 miles per week all by myself. Sometimes coming up with the answer is really difficult! AHH! Congrats! (Seriously, you write the best blog post titles.) What a fantastic job, and your hard work has really been paying off lately 🙂 Glad to hear you made a decision on the upcoming half – sounds like a good one, and you can fully commit to training for Miami (plus, hopefully a new PR!). As you know, half marathon training is on my mind at the moment. I plan to talk more about my running goals for 2015 in a couple of weeks, but I’m hoping to break 30:00 in the 5K. I’m running a 5K this upcoming Saturday to set a baseline, which will almost certainly be a PR (my last 5K was around 12:00/mile pace back in…2012? 2013?). Here’s to big goals and crushing them! I know you’ve been wanting that sub-30 and 2015 is definitely going to be the year you’ll get it! You don’t have that much time to shave off! Look out Miami, Speedy McSpeederson is running to town! Awesome Kristina!!!! Thrilled for you!! You’re going to have a great race!! THANK YOU! 🙂 I’m feeling pretty good!!! So awesome! Isn’t it awesome when you can see the results of your hard work and just totally exhilarating when your body surprises you?! Congrats! Oh no, sorry to hear that, but I bet your running group will make it enjoyable! I saw your email but have been swamped tonight with a million things to do, I promise I will email you back asap! YYYYEEEESSSS!!! I’ve loved following you and seeing your progress! I’m excited to see how you do in January considering you’ve logged in some great runs lately! I really, really, really want a sub 4:30 on my next marathon (Feb). Ooooh nice job!!! You are totally getting faster!! And you’re so diligent about running bridges…as you get faster I know you’ll keep at the speedwork etc and the next hing we’ll know you’ll be running in the 8’s for miles at a time!! It will be a really long time until I am running miles in the 8s…. like it may never, ever happen, but I’m okay with that as long as I can see that number flash up every once in a while! Awesome 🙂 I love seeing that quick pace! You are doing great! That’s the beauty of a Garmin and stats, they are motivating! I feel like my only end-of-year running goal right now is to keep running. I’ve been traveling a ton and running around doing a million things and it has been way to easy to skip workouts… oops!